Enze Jin presents his research achievements at the PIRE meeting held in Eugene, Oregon. 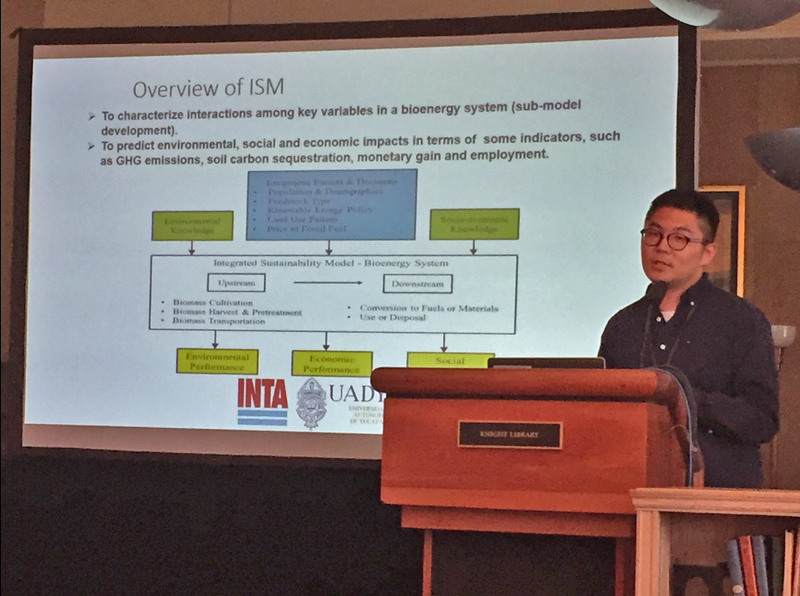 In May 2017, Environmental and Ecological Engineering graduate student Enze Jin presented at the Partnerships for International Research and Education (PIRE) meeting in Eugene, Oregon. PIRE is a National Science Foundation program that supports projects which aim to advance research and education that could not occur without international collaboration. During the meeting, Jin reported his research achievements and discussed the importance of further opportunities for collaboration with others. Jin, alongside Professor and Fehsenfeld Family Head of Environmental and Ecological Engineering John Sutherland are involved with a PIRE project that forms a multidisciplinary research team collaborating with individuals from universities in Mexico, Brazil, Argentina and the U.S. to study the sustainability of bioenergy development across the Americas.